intend to carry out any legal transaction involving your property or piece of land. Through mutation, the person buying your land or property can get the chance to change revenue records to his name. As soon as land or properly has been mutated, every detail will be updated in the revenue records. The updated records are then sent to civic bodies like the Municipality Corporations for maintenance purposes. Citizens of West Bengal state can now get their mutation status online thanks to the Directorate of Registration and Stamp Revenue website, West Bengal. This website operates 24/7 hence making it easy for land and property owners of West Bengal to access their mutation case status at any time of the day. Moreover, you can have a look at these details from any location that you term appropriate so long as you have an internet connection. Any resident of West Bengal who wants to check their mutation status online can follow the guide given below. Enter banglarbhumi.gov.in on the search bar of your preferred browser. You will be redirected to the homepage of Banglarbhumi website. Place your mouse cursor on “Citizen Service” tab before clicking on “Mutation Status” in the drop down sub menu that will appear. A new web page will then be displayed on the screen of your device. Here, select the option that you wish to use in checking mutation case status. These options are “Case Wise Search” and Dead Wise Search”. Correctly select your district name from the box set aside for this detail. You will then have to select the block number and mouza of your property or land. Fill in the case number carefully to avoid any mistakes. Finally, click on “Submit” button to send the details. 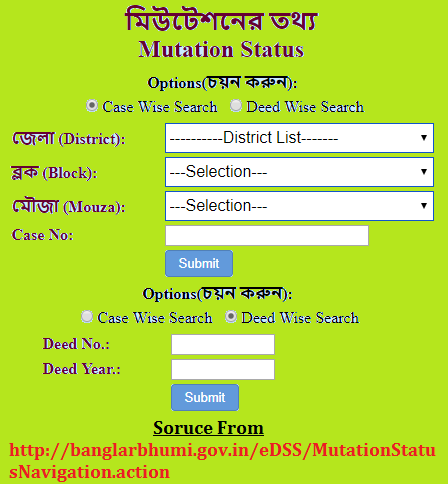 You will then be able to check the mutation case status using case wise search in Banglarbhumi website. When using the deed wise search option to check your mutation case status, you will have to correctly enter the deed number and Deed year. Click on “Submit” button after filling the above detail. You can then see the mutation status of land or property using deed wise search option. It is highly advisable that you download the mutation status for future reference. To do this, click on “Download” button after which you should select the folder for saving this information. You can also print the mutation case status by clicking on “Print” button. You now have a hard copy of the mutation case status. Below are some of the importance of Mutation to land and property owners. Stands as proof of ownership and may at times act as a tax record. Ensures that your property record is clean especially when you update it regularly. Mutation papers are required whenever you wish to sale your land lf property. Make sure that you update the mutation of property on a regular basis in order to avoid legal problems. Mutation khu.no.and dag no.of Manas Neogi of RADHAKANTAPUR ABAD Mouza in Mathurapur- 2 Block ,SOUTH 24PGS. I HAVE A PROPERTY IN THE DISTRICT OF NORTH 24 PARGANAS AT KHARDAH. BUT PROPERTY WAS RECORDED IN THE NAME OF MY FATHER WHO DIED IN 2018. PRESENTLY THE SAID PROPERTY HAS BEEN REGISTERED IN MY NAME BY WAY OF A DEED OF GIFT. PL.LET ME KNOW HOW THE THE SAID PROPERTY WILL BE MUTATED IN MY NAME NAME AND GET A PORCHA. YOUR EARLY REPLY IS SOLICITED.